That's right, the challenge is on! We're gonna do it!!! One room woo!! 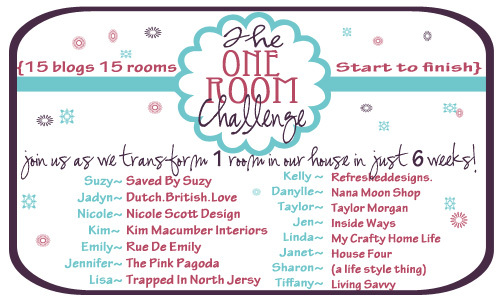 I am so super excited to be joining 14 other blogging ladies in the challenge to finish one room in your home. Finish! Over the next 5 weeks we'll be tackling a room from start to finish and sharing our progress each Wednesday. The room I've chosen? The dreaded spare bedroom (que horrifying music now). Embarrassing... more on that here. Livable, but not pretty by a long shot. More on that here. I'm ready. This room will not beat me!! 1. Storage: Oh. My. Gosh. Storage is the number one biggest problem in this room. We can't install any kind of permanent storage solutions (ie built-ins), but we definitely need the storage space that a wall of built-ins would provide. 2. Technology: Tim has some really awesome music equipment in this room and happens to have it in the most perfect-to-use set up ever. It's great! But... it's a little unsightly. I'll be working hard to creatively balance out the technology without reducing usefulness. 3. Color: We're not allowed to paint so color solutions are a little tricky. I'm working up some ideas for balancing out all of the black we have in the room from music equipment. 4. Budget: There really isn't one, as in as few dollars as humanly possible. Also, we're very unsure of how long we'll stay in this apartment, so we don't want solutions that will only work for this place. To recap, anything purchased needs to be c-h-e-a-p cheap and versatile for other spaces. So that's it! I'm rearing and ready to go, so you can expect some pretty fun DIY updates over the next few weeks!! I'm also pinning inspiration for the room, so feel free to follow along there as well. What do you think? Gonna join the challenge! ?